This image shows light striking molecules of DBTTF and buckyballs (green region) causing the two-dimensional nanosheet to expand. Image: Richard Remsing, PhD, Temple University. Borrowing from the concept of plastic-like toys that swell when placed in water, a team of US and Chinese engineers has discovered that tiny crystal lattices called ‘self-assembling molecular nanosheets’ can expand when exposed to light. This advance, reported in a paper in the Proceedings of the National Academy of Sciences, could form the backbone of new light-powered actuators, oscillators and other microscopic electronic components useful in the development of artificial muscles and other soft robotic systems. The work centers on a materials science concept known as photostriction, which means turning light directly into mechanical motion, says the study's co-lead author Shenqiang Ren, a researcher at the University at Buffalo's RENEW Institute, which works to solve complex environmental problems. "We're using light – anything from sunlight to a simple laser – to cause the two-dimensional nanosheet to expand at an incredibly fast rate," he explains. How fast? Sub-milliseconds. The process is aided by the photostrictive effect, which essentially bypasses the need for electricity to move something, says Ren, who is also a professor in the Department of Mechanical and Aerospace Engineering at the University at Buffalo’s School of Engineering and Applied Sciences. 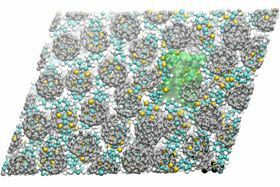 The nanosheet – made of the molecular charge-transfer compound known as DBTTF and the spherical carbon molecules known as buckyballs – can expand by up to 5.7% of its original size, according to the study. While that may not sound like much, a 200-pound man who expands by 5.7% would need to add 11.4 pounds in less than a second to keep pace with the light-triggered nanosheet. Expandable water toys grow much more than that, but they do not revert to their original size. By contrast, the nanosheet does, making it potentially very useful as a light-induced actuator in artificial muscles, which have applications in everything from medical devices to industrial robotics. This story is adapted from material from the University at Buffalo, with editorial changes made by Materials Today. The views expressed in this article do not necessarily represent those of Elsevier. Link to original source.